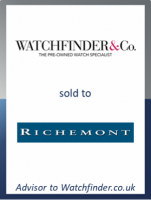 GCA Altium has advised Watchfinder.co.uk, the leading pre-owned premium watch specialist, on the sale of 100% of its share capital to Richemont, the global luxury goods group. This transaction confirms GCA Altium's position as a leading M&A advisor in the consumer and e-commerce sectors. The UK consumer team has now completed 18 UK consumer deals in the last 18 months. The transaction is also a further example of our expertise in the luxury watches sector, following the recent sales of Breitling to CVC and Ulysse Nardin to Kering. Established in 2002 in the United Kingdom, Watchfinder has grown organically under the careful stewardship of co-founder Stuart Hennell to become the leading platform to research, buy and sell premium pre-owned watches, both online and through its eight boutiques. In addition, Watchfinder operates a highly qualified customer service centre and employs c.200 employees worldwide. The transaction is expected to close in the summer of 2018 and remains subject to FCA approval. Further details were not disclosed.